I have posted my baked peanut butter oatmeal, a baked peanut butter chocolate chip version, and my baked pumpkin oatmeal. I even posted my soy butter version that my daughter enjoys. All of these are family favorites and we enjoy them, but today I have yet another version for you that we love and it is Baked Banana Oatmeal. 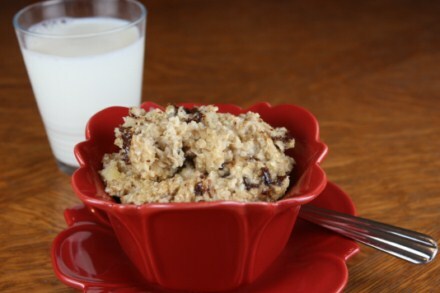 I love these baked oatmeals because not only are they easy to make, they are a healthy breakfast that my kids love. This version is a basic baked banana oatmeal that we add chocolate chips to. The banana version is one of the most versatile of the baked oatmeals that I have come up. I think it would be good with nuts and cinnamon added instead of the chocolate chips. This would make it a banana nut baked oatmeal. You could also easily add peanut butter to it and make it peanut butter banana baked oatmeal or peanut butter, banana, chocolate chip. There are so many ways you can make this and that is what I love about the basic baked peanut butter oatmeal recipe that I came up with. They are all so easy and so good! Some of you have already shared with me that you have experimented and come up with a banana version and others versions that you love. I am so glad that many of you enjoy the baked oatmeals as much as we do. Look for more fun variations coming next month. I have a few more to share. sounds good! Might have to give this a try for breakfast in the morning :o) Thanks for sharing! We have tried and love your other versions and now I can’t wait to try this. My little guys eat it like a cake but we love the milk added to our bowls. Your breakfast recipes keep variety in my menus. This sounds AMAZING! I LOVE the taste of baked/cooked bananas. Many people don’t realize that they take on totally different, sweet and yummy taste when cooked! My kids used to love oatmeal, but they haven’t really liked it as much lately, which bums me out because it is so good for them, so I am hoping that something like this, that also has bananas, which they love, in it, will get them eating it again! 🙂 Can’t wait to try it! Glad I found your site! @Kelley, I agree bananas taste very different cooked. We love them both in baked goods and just plain. I am so glad you found my site. Thanks for reading! Sounds yummy! How many portions this makes? Seems like it may be a lot for our family of three. Does it taste good reheated later? @Marta, I have three kids, so five in our family and this is just about one breakfast for us. Yes, it reheats well. I often double it so that we can get a couple of breakfasts out of it. I hope that helps. This sounds like such a comforting breakfast. 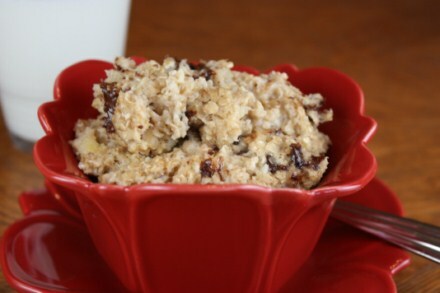 I love baked oatmeal and think your variations sound fantastic!! Yum, this is getting me ready for breakfast. I’d love it if you came and linked this up to my Holiday Recipe link party. This would be perfect for Christmas morning. Oh my goodness this looks so yummy and easy too! Thanks for sharing!!!! Could you substitute old-fashioned rolled oats and how would you change the recipe for that? @Chris, I have not tried it with the banana version, but I have with some of my other versions and yes it works, but the texture is a little different. I hope that helps. Just thought I’d add that I made this this morning and it was awesome. But, after making it and eating it I realized I had forgotten the brown sugar. And it was still great and plenty sweet with the bananas and chocolate. Thx for the recipe. We loved this. Tastes just like Banana Bread. I left out the chocolate chips and added walnuts (no nut allergy here). @Tannis, I am so glad that you enjoyed this. And yes it does taste a lot like banana bread. @Sharon, I probably could just about make it in my sleep. And I still have another couple of versions to post about. 🙂 I love them all and so do my kids. So easy and so good! yum! can’t wait to try this and the peanut butter one! @MicheleR, I hope you enjoy it. Both are a favorite in our family. Stupid question, but do you store covered in the fridge or covered on the counter? Can’t wait to make & try it!! @Kim B., I store the leftovers covered in the fridge. I hope you enjoy it! This sounds absolutely delicious!! We did love the peanut butter oatmeal, so definitely have to try this one now! 🙂 Thank you for these awesome recipes! @Sandra, I hope you enjoy it! My kids love it especially when I add a few chocolate chips. My daughter and I made this for breakfast this morning and it was SO good! New things can be hit or miss with my 2 year old but she gobbled this right up! I also want to tell you I’ve tried and love lots of your recipes! Your blog is definitely a go-to for me when I”m looking for something new! @Sarah, Thank you! I am happy to hear that your daughter enjoyed it. It is a favorite with my kids also. Oh yummo! Just made it to eat over the next couple days during my work stretch as a nurse. This is way better than I thought it would be! Only thing I did different was used honey instead of brown sugar! Thanks! Just wondering if you’ve ever tried mixing up baked oatmeal the night before, and how it turned out? My other baked oatmeal recipes work great made up the night before and baked in the morning. This banana one though is not as good when made up the night before. The mashed bananas do not hold up well and they turn brown. However, I do like to make a large batch of this and any of my other baked oatmeal recipes bake them and reheat them throughout the week for breakfast. That works great! I hope that helps and that you enjoy the oatmeal recipe. I agree. This is a great gluten free breakfast. I am so glad you enjoyed it. I just made this for my daughters today and they both enjoyed it. Although I do have plenty of leftovers for the week! I am going to refrigerate a couple of chunks for tomorrow’s breakfast and freeze the rest so they can have “instant” oatmeal at hand. Made it for breakfast this morning for the first time. It was so good(even without the chocolate chips). My first time eating baked oatmeal and I think we’ll be making it again soon! Thank you! I made this for breakfast this morning and it was quick and easy. The kids declared it delicious! I just plugged this recipe into Sparkrecipes.com and found that with 1% milk and walnuts instead of chocolate chips there are only 234 calories per serving (with the entire recipe making 10 servings). That’s not too shabby! I think I’ll be making this pretty soon! Thanks for the recipe! Any suggestions for trying these baked oatmeal recipes without eggs? My son has a severe egg allergy, so I’m wondering what a good alternative would be. We can’t use egg replacers, but sometimes find ground flaxseed mixed with water to be a good option. Sounds delicious! The egg acts mainly as a binder and for texture, so yes I would try the flaxseed and water. I think that should work pretty well in place of the egg. He must really like it to think of it as dessert. 🙂 But that is so cute! I agree this is so kid friendly. Mine eat it all the time and love it! I made this today and it was so delicious! I’m diabetic so to cut back on the extra carbs I added walnuts instead of chocolate chips, it can even stand to cut back on the brown sugar so I’m going to try 1/3 cup next time. Thanks for the recipe! I love nuts added to this, but since my daughter is allergic to all tree nuts and peanuts, we now have to avoid them. A little peanut butter added to this is also good. 🙂 I am glad to know that cutting back the sugar worked for you. Thanks for letting me know how much you enjoyed it! This is a really good recipe. I made 1/2 the amount for two people. I added 1/2 the brown sugar inside and 1/2 to the top when there was only 4 minutes of cooking time left. Put it on broil for the last 2-3 minutes so that the top got crispy and caramelized. Tip: don’t try to add sliced bananas to the top because they turn black…Very good recipe, very decadent!! My oldest son is 4 and has never eaten any type of oatmeal until your baked oatmeal recipes. He loved them from the start. THANK YOU so much. It is so nice to get a healthy breakfast in him. Great site with many good recipes. I am trying this tonight! I looked up the calories the way the recipe is and added a 1/2 cup skim milk to poor on top and came up with 192.2 calories per serving- I put that it makes 9 servings… sounds pretty healthy to me!! Thank you for the great comfort food 🙂 Do you have a recipe for a raisin cinnamon oatmeal bake? Thanks again! Yes, I have a version, but it is not posted. I will try to share that this fall. I would really like to try this recipe! I was wondering how I would change it to use steel cut oats. Any thoughts? I have never tried it. I would probably work, but you might need to adjust the liquid and cooking time. I would love to hear how it turns out if you try it. Hi Lynn, thank you so much for this recipe. Made it yesterday for breakfast and shared some with one of my gym friends. Everybody loved it so much. I am glad everyone enjoyed it. It is one of my family’s favorite ways to eat oatmeal and I love hearing that others enjoy it as well. I can’t wait to try this! Perfect timing! For the first time in a year I have 3 overripe bananas on my counter. My 6 year old will definitely help make this today. Thanks! I hope you enjoy it! It is a great recipe for kids to help with. I am loving your baked oatmeal recipes!!! Just made this one and my whole family adored it!! Thank you for sharing! Oh yes, and I saw someone was wondering about using frozen (thawed) bananas, I always do this and I used frozen thawed bananas for this recipe and it worked perfectly! I am glad to know that works. I have used frozen bananas for other things, but I don’t think I have ever used it in this. So thanks for letting us know it works. I make this all the time (and other variations) and love it! But I’m wondering, have you ever tried doing it in muffin tins? Yes it can be. In fact all of my baked oatmeal recipes work great as “muffins”. I like to make them that way and then freeze them. You simply make up the baked oatmeal and cook it in a greased muffin pan at 350 degrees for 15-18 minutes. It works great. I hope that helps.